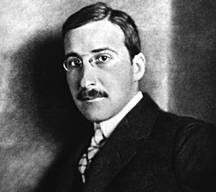 Stefan Zweig (German: [tsvaɪk]; 28 November 1881 – 22 Februar 1942) wis an Austrick novelist, playwricht, jurnalist an biografer. At the hicht o his leeterar career, in the 1920s an 1930s, he wis ane o the maist popular writers in the warld. ↑ Kavanagh, Julie (Spring 2009). "Stefan Zweig: The Secret Superstar". Intelligent Life. Archived frae the oreeginal on 8 December 2012. This page wis last eeditit on 27 Februar 2018, at 19:54.